Crete might be an idyllic tourist island now, but during a 12-day period in May 1941 a mixed force of British, Australian, New Zealand and Greek troops fought like demons to try and repel a German invasion. When mainland Greece fell to Nazi forces in April 1941, attention quickly turned to securing the territory – which is the largest island in the eastern Mediterranean. Its central position in the Aegean sea and its harbour at Suda Bay made Crete the ideal place for naval operations. The airfields on Crete were also important as planes based there could hit targets in North Africa, disrupt Nazi oil production in Romania or attack British shipping in the Suez Canal. The capture of Crete would also stop Allied forces from launching counter-strikes into the newly occupied Balkan region, which the German war machine had trampled through in 1941. 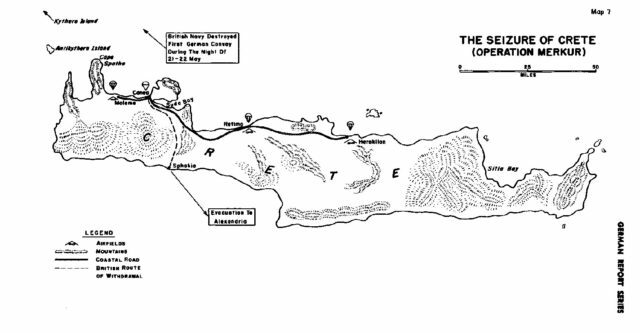 A map of Operation Merkur, the German airborne invasion of Crete in May 1941. Despite concerns that opening up a new area of conflict would distract from Hitler’s plan to take eastern Europe, he was won over by the Luftwaffe’s plan to use paratroopers to carry out the assault. The Fuhrer gave his consent for the invasion to go ahead, but with the strict caveat that it must not distract from the invasion of the Soviet Union in any way. German air forces then carried out a bombing campaign on the island, which forced the Royal Air Force (RAF) to evacuate their planes to Egypt. Thanks to the success of the Allied ULTRA intelligence operation, commander of Crete Lieutenant General Bernard Freyberg was aware of the incoming threat – and as a result, he could plan the defence of the island in advance. Geography made defending the island a difficult task, as did the poor communications equipment among the fighting forces. The key positions were all on the northern face of Crete, which was just 100 kilometers away from from the Axis-occupied mainland. The airfields at Maleme, Retimo, and Heraklion were locations of vital importance, as was the port at Suda Bay. These had to be defended, as the Allied high command was unwilling to destroy them because of their strategic importance. 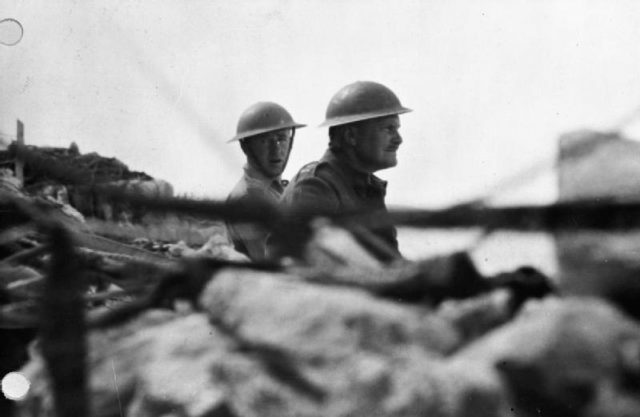 Lieutenant General Bernard Freyberg VC, commanding officer of the British forces on Crete, gazes over the parapet of his dug-out in the direction of the German advance. Freyberg had a large force under his command, around 40,000, but they were poorly equipped and lacked the ability to communicate with each other effectively across the rugged, mountainous terrain of the island. This would prove to be a fatal undoing, despite the valiance of the men on the ground. Within the 40,000 were 30,000 British, New Zealand and Australian troops and 10,000 Greeks. Most of these had been evacuated from the mainland after it fell to the Axis forces – many had their own weapons, but lacked the heavy armaments that would have made a difference in the fighting. Along with the ground troops, General Archibald Wavell, commander-in-chief for the region, provided Freyberg with 22 tanks and 100 pieces of artillery. These guns were in such a poor state that they were stripped down and turned into 49 pieces of better quality. Although the tanks and heavier weapons were a positive addition to the defending forces, they were too thinly spread across the island to be able to have a significant influence on the outcome of the failed defence. The battle began on the 20th of May, 1941 after German paratroopers jumped out of their Junkers JU 52 airplanes and the majority landed near the Kiwi defended Maleme airfield. The invading force suffered badly during the first day, with a company of III Battalion, 1st Assault Regiment losing 112 of 126 men. Of the 600 men who started the battle in III Battalion, 400 would lose their lives during the first day of the invasion of Crete. Those crewing the glider transport fared worse, as they were either shot down or the crews killed by defensive forces after landing. Towards the evening of the 20th of May, German forces pushed the defenders back from Hill 107, which overlooked Maleme airfield. A second assault wave was also launched, and more Axis troops were dropped. One group of enemy forces then attacked Rethymno, while a second began operations near Heraklion. Defensive units were waiting for the Germans, who suffered heavy casualties. Despite this, a breach was made in the defenses set up by the 14th Infantry Brigade, the 2/4th Australian Infantry Battalion and the Greek 3rd, 7th, and Garrison battalions.